The Chekhov trio is a piano trio with its roots in Maastricht, where the trio was founded in 2016 to participate in the chamber music program of the Maastricht Conservatory. Dutch violinist Emma Rhebergen, Russian cellist Alexandra Charnomskaya and Belgian pianist Fem Devos find their inspiration for playing chamber music, and in particular piano trio, in acting: searching for characters and interpretation of the different roles in the ensemble. The name of the trio is a result of this inspiration. Performances brought the trio to stages all across the Netherlands, such as in Maastricht, Heerlen, Leiden, Amsterdam, Tilburg, Roermond and Kerkrade. They participated in the Orlando Festival 2018, and made an appearance on the Dutch national radio (radio 4). 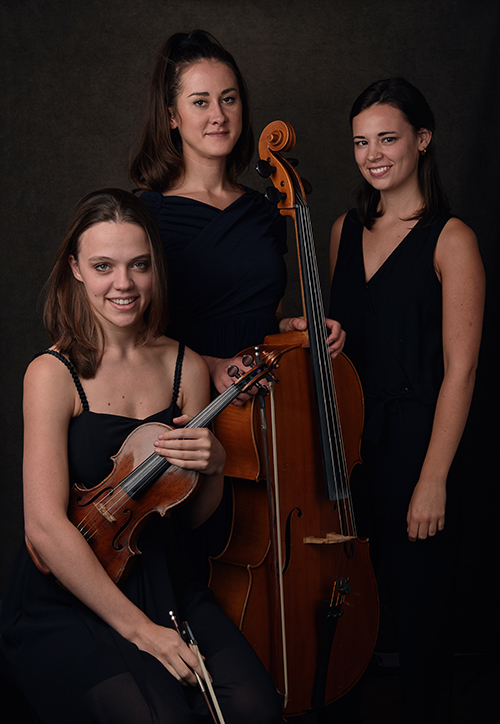 In November 2018, Chekhov trio won the second prize and the special “KCB award” in de international music competition Triomphe de l’art, in Brussels, Belgium. Chekhov trio studies with Henk Guittart at Maastricht Conservatory and has taken part in masterclasses with, amongst others, Alexander Bonduryanski, Hardy Rittner, members of Rus quartet, Nemtsov duo, Peter Brunt and Sigiswald Kuijken. Duo Emma Rhebergen & Michelle Chow is a result of their long lasting friendship and their combined passion for chamber music. Emma and Michelle met each other as young students at the School for Young Talent at the Royal Conservatoire in The Hague, and they have played together as a duo since 2013. They recieve lessons from Michael Dussek and Yuzuko Horigome, and in the past, they were coached by Ellen Corver, Hans Eijsackers and Sepp Grotenhuis. As a duo, Michelle and Emma enjoy developing a broad scala of repertoire, from which they always choose for adventurous and exciting programs. They performed in concerts throughout the Netherlands and in London, UK. 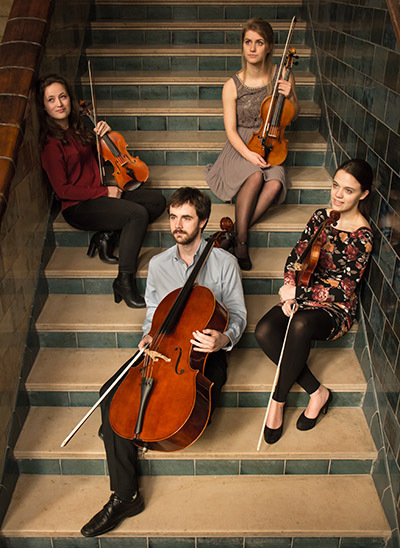 Metis Quartet was established in November 2015 by violinists Emma Rhebergen and Ana Termeulen, violist Anna Meenderink, and cellist Carlos Leal Cardín. The four musicians met during their studies at the Royal Conservatoire in The Hague. The four members found each other through their love for the string quartet repertoire. They enjoy discovering and drawing attention to unknown or less often played music for string quartet. The musicians have a shared feeling of musical interpretation. They strive for transparency to bring justice to the different voices, while at the same time not losing sight of the harmony of playing together. The Metis Quartet participated in the Zeister Muziekdagen (2016) where they had master classes with members of the Emerson Quartet, the Cuarteto Quiroga, Valentin Erben (Alban Berg Quartet), and Alexander Pavlovsky (Jerusalem Quartet). With the Danel Quartet, the Metis Quartet had a series of master classes, which concluded with a concert in Tivoli- Vredenburg in May 2017. Furthermore, the Metis members have had lessons with Johannes Meissl, Lucia Swarts, Vera Beths, and Liesbeth Steffens. The Metis Quartet has performed in the national concert halls, such as during the Grachtenfestival 2016 in Amsterdam, where they played Haydn, Shostakovich and Grieg. They have also played in The Doelen in Rotterdam in the finals of the Grote Kamermuziekprijs (2016).